There are so many possiblilties for using egg cartons. Here’s another one that will provide hours of fun. Cut 2 individual egg cups apart. 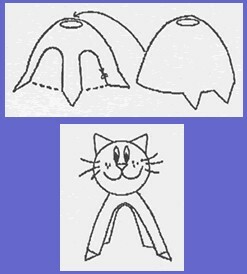 One will be the body and tabs can be cut at the four corners for the cat's feet. On that same cup, cut out the sides to make legs. The other cup will be the head section and two tabs can be cut out of two corners to make the ears. Glue the head section on top of the body section. Decorate the face by glueing grass, twigs, etc for whiskers, and a pompom, paint or felt for a nose. Attach a bit of yarn for a tail… and hang. The ears and tail can easily be changed to make a dog. Click on printables for a diagram to help you. This craft reprinted courtesy of the Alberta Egg Producers. This site is produced by an innovative team in Canada informing the public about the benefits of eggs.